The Maids Brigade c1950s - Click on the photo to open another window - click on the photo again to access a very large copy. This photo of the Maids Brigade at Lewes Road Congregational church was taken in the early 50s when I was 7/8 years old (as far as I can remember). I have very happy memories of the time spent in this company which, I believe, was the only one of it’s kind, though it was similar to the Girls Life Brigade (now Girls Brigade) to which I also belonged for a short while when I first moved to Hove. It was a Church association so we were expected to go to Sunday school each week too and we also had church parades. We started as Cadets then Juniors and as far as I remember progressed to Seniors. Our time was spent doing drill (marching) playing team games, doing exercises, dancing (I particularly remember learning the Scottish sword dance!) and working towards achievements such as singing, cooking (at home) and I think elocution too. We sang the Brigade hymn ‘O Jesus I have promised’ and paid ‘subs’ of 2d a week. As you can see we were a large company back then with a very suportive group of leaders who gave many years of loyal service – indeed Mrs Gee seen in this photo was also in the previous photo taken in the 70s. Reading left to right throughout. Can you fill in any gaps? If you can help please leave a message below. Click on the photo to open another window – click on the photo again to access a very large copy. Dear Grannie, Thank you for sharing your photo. How exciting to see so many familiar faces again. Although I was not in the Maids Brigade myself I was affiliated to this particular church and it’s activities. My father was in the Boys Brigade from an early age and at seventeen joined the amateur dramatics that went on there too. Gilbert and Sullivan operettas were put on there every year and when dad met my mother she joined the society too. Therefore at the tender age of three I was taken along every Monday evening to rehearsals of The Mikado, Pirates of Pensanze, Iolanthe and so on. When I was about 13, I joined the junior dramatics and appeared in some pantomimes which is where Grannie and I met. From this photo I recognise so many faces but not many names. What is impressive, is how happy everyone looks. I remember Margaret Pelling and Valerie Gee as they also became part of the operatic department. (soon I hope to send in pictures of the G&S operatics so you can see some of the same faces). I remember Mary Triggs well too from panto days and her mother who always took care of wardrobe for all the pantomimes. Mary had a younger brother too but can’t remember his name. Mrs Richardson was, of course, director of the pantos and Sylvia Finch I remember as part of the Drama group who also practiced in one of the big school rooms that were part of this building. These school rooms, practice halls, stage, auditorium and canteen were all affiliated to and adjoining the Lewes Road Congregational Church situated on the Lewes road not far from the Gaiety Cinema. The title for these antics were then known as ‘The Lewes Road Amateur Operatic and Dramatic Society’. Going back to faces I remember well the person top right corner but can’t recall her with that name. There was a Meryl in panto but this lady also joined the G&S later on but I would give her another name? Sheila Robins, Marion Joiner and you, Grannie, from panto days are fresh in my mind with or without photos to remind me. The Rev. Mr Gatland and Mrs Gatland are also clear as a bell in my mind. Not just from Sunday church but also Christmas parties that went on in the main hall. End of Season Parties and so on. I remember attending church services, Christmas carols, Easter events where my parents and the operatic department were sometimes asked to form a choir for special hymns, normal Sunday services and a few appearances I made somewhat under protest as the teenage rebel emerged in me! 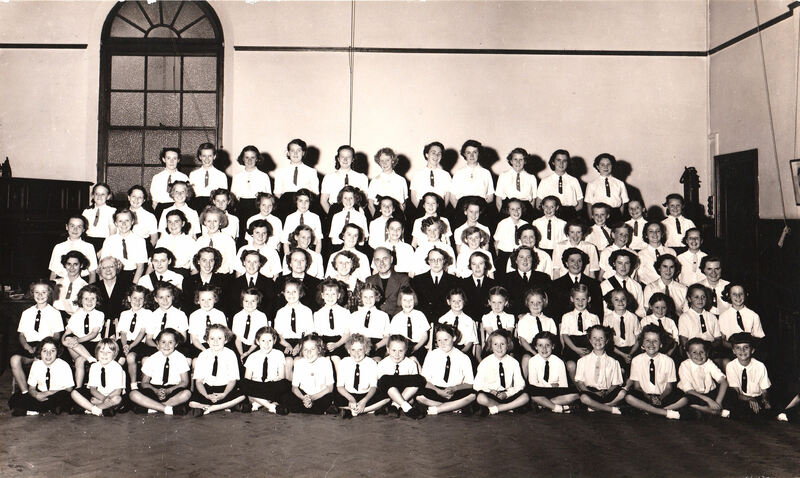 I believe the window in this picture would be looking out to the side entrance of the building and the door behind all the girls will have been leading both to the main Lewes Road and upstairs to all the school rooms. This big hall was also used for the dressing room for some of the shows. A curtain down the middle would divide it for men and women. It was a bit chilly I recall. The upstairs rooms were warmer for changing clothes but this hall had another door to the back which led directly to back stage so maybe we had some quick changes that made it more timely all round. Well, I could reminisce all day about this picture. Maybe someone else will enter some comments to help us further on, Grannie. Many thanks. Sandra. I have just discovered a 5 1/2″ x 3″ copy of this photo in my late mother’s collection (which I am in the process of sorting out….)! Handwritten on the reverse is ‘1953’ and the look of Sheila would fit with other pics of her at that time. Can I suggest then that this is 1953? Additionally, the pics of me in The Life Boys in the ’60s certainly match my suggested location for this pic. For some reason I keep getting drawn back to this pic. My mum grew up in the Lewes Road area. She was one of a twin, names Patrica and Cathrine Winter (Cath and Pat) they have an older sister Marie and a brother Henry. Just thought I’d ask to see if any one knew them. Sadly mum passed away five years ago, but my Aunty Pat, Aunty Marie and Uncle Henry are still going strong. Hi Grannie, Sandra here. Looks like we need your memory here too please. Geoff has another idea for which room this was taken in. I am curious to know where you think it was. Was it the main hall at the front of the building or the hall at the back where the pantomimes and shows went on? If the latter then we must be looking at the stage door on the right but what did the window look out on? That must also be the side entrance on the far right of the building. What say you? Hello Geoff, can you please confirm who your sister is? The only Sheila I can remember is Sheila Robbins, is that her? If not can you please place your sister in the photo, so many names have slipped my memory. I think the date you have is right but I was not absolutely sure when I submitted the photo. Also you are right about the location of this hall, it is where the panto’s and operas were performed – where the weekly meetings of Maids Brigade were held. So sorry Janice but your relatives names do not ring any bells with me, perhaps they do with others who may visit this page. Hi Grannie, I am indeed Sheila Robbins’ little brother! So little I wasn’t even born when this photo was taken! As it happens I first spotted the photo shortly before her 65th birthday so I e-mailed the link to her sons and it mysteriously appeared in hard copy at the little family gathering that weekend – cue mirth and reminiscences in equal measure. I have many memories of that room, we in the Life Boys and then the BB used to use it as well. You may have seen the other Maids Brigade photo on the site – some of those girls were my contemporaries. Strange how these coincidences happen. That’s okay, and thanks for getting back to me. The girl 3rd from the right in the third row is Jean Gule, Yvonnes older sister. I was at the ESRO at The Keep the other day and they hold there the Maids Brigade Diary and Record of Awards for the years 1957-58 through to the 1970s. A small book, it lists the officers for each year, any significant events and the awards won by the girls. A little piece of Lewes Road history with some familiar (to me anyway) names in it. Hello. Regarding the above photo: In the third row at the very end, I believe, is my late sister, Valerie Reeves. I am in there as well but not sure which one is me as I was very young, but I will keep looking. I am trying to find more of these memories online. Oh, there I am slap bang in the middle of the front row. What memories. Regarding the comment,” that is me in the middle of the front row ” that was not me, and I don’t think it is me either. Just in case the person it was may recognise themselves. Thank you. I too was a member of the Brigade for many years. The philosophy and discipline of the Brigade set me up for life. I loved it, especially Mr. Ansell taking us for gym! Through the Brigade I made many friends and met my husband – through Boys Brigade. back row, r.hand, last 3: Mary Matthews, Sheila Chadwick & Olive Ball. 4th row down: Violet Croucher, Flo Richardson, Sylvia Finch, -, Edna Patching, Win Patching, Mrs Gatland, Rev Lionel Gatland, Miss Wilton, Mrs Gee, Edna Norman, -, Jennifer Banks (me), Audrey Norman. Behind Mrs Gatland is Valerie Gee. I hope this helps, when I meet up with friends they may be able to add to the names. It was good to be reminded of very happy times. My mum is/was Janet Aitkenhead.